The origin of the game of hockey is a hazy and contentious issue. Various forms of field hockey were played in Scotland, Ireland, and France as early as the sixteenth century. A game involving sticks and balls played on ice called kolven was first recorded in Holland in the seventeenth century. The French called their game hocquet, which likely translated into the modern name of the game. Native Americans in eastern Canada had been playing baggat-away, now known as lacrosse, for hundreds of years by the time the French arrived. A fresco from the Athenian acropolis shows two men holding sticks and battling for possession of a ball. The modern game is generally accepted as having originated somewhere in Canada in the mid to late 1800s. Claims are laid to the official birthplace of the game from Kingston (Ontario), Montreal, and Halifax. The first know codified rules were produced in 1879 at McGill University in Montreal. In 1892, Canada's Governor General Lord Stanley introduced the game's first national title, the "Lord Stanley's Dominion Challenge Trophy," now simply called the Stanley Cup. Regional leagues prevailed across Canada and the United States for several years. In 1917, the National Hockey League (NHL) was founded in Montreal, and by 1926, the NHL had absorbed most of the competing leagues and took sole possession of the Stanley Cup. Until a Montreal company began manufacturing hockey sticks in the late 1880s, most players made their own. A player would cut down an alder or hickory sapling, cut out 3 ft (91.44 cm) sections of trunk with branches attached, and file the wood into the desired shape. These first sticks had short handles and small, rounded blades, much like field hockey sticks. Even as play became more organized and stick manufacturing moved from the woodshop to the factory, stick development was slow and evolutionary. First the blades grew longer and squarer, allowing better control of the puck. Then, the shaft grew longer so that players lost the hunched over stance of early games. However, the stick was still fashioned from a single piece of wood, which made it heavy and made the thin blades prone to splitting. In 1928, the Hilborn Company, a stick manufacturer in Montreal, produced what is acknowledged by some to be the first two-piece hockey stick. The new design, with separate pieces for the blade and shaft, freed stick makers from having to find appropriately shaped lumber and allowed blades to be replaced when they cracked. Separating the blade from the shaft also gave manufacturers new latitude to experiment with the shape and thickness of blades. It was not until the late 1960s that blades took their largest jump in shape change when they began to take on a curve. One story, possibly apocryphal, attributes the design revolution to Chicago Black-hawks star Stan Mikita. The story tells that Mikita, frustrated during practice, was trying to break his stick by jamming it between the player's bench gate and the boards. The stick would not break, but its blade did bend remarkably. The new curve gave Mikita exceptional control and speed when shooting. Today, every player has his own preference about the amount and placement of the curve, but all blades have it. The next change came in the 1970s, primarily as a response to increased competition for wood supplies. During that time, foreign demand for ash wood raised prics beyond what stick makers could afford. Typically, only 10% of the wood in a shipment would be of acceptable quality for use in a stick, so manufacturers needed an enormous supply. They began to experiment with lamination as a way to use less and varied types of wood. Ultimately, the cost-cutting measure produced stronger, lighter, more responsive hockey sticks. Today, most high quality wood sticks are laminated. The three qualities any player is seeking in a hockey stick are stiffness, lightness, and responsiveness. Lack of flex is supremely important in the blade, where any twist can deflect a shot from its intended path. Most stick makers still use ash wood for their blades because ash is hard and durable but can be easily curved. Blades are wrapped with fiberglass to increase their stiffness and their abrasion resistance. While rotation or twisting of the shaft will cause the same problems as they would in the blade, a certain amount of flexibility along its length is necessary. When a player makes a slap shot, he lifts the stick behind his body and swings it down toward the puck. The first thing the blade contacts is not the puck, but the ice. When a baseball player swings a bat or a golfer swings a club, they are taking advantage of a physical property known as rotational inertia. Inertia means that an object in motion will tend to stay in motion until encountering an opposing force and an object at rest will tend to stay at rest until acted upon by an opposing force. With rotational inertia, that tendency to stay in motion is multiplied by the weight at the end of the diameter of an object's arc or swing. The greater the weight and the further it is from the center of the swing, the greater the rotational inertia. However, hockey sticks are light, especially on the end, precisely because a player needs to be able to quickly change the stick's direction. A hockey stick needs another way to make power. In driving the stick into the ice, the player flexes the shaft slightly and stores energy in it. As the blade comes closer to the puck, the player lifts the stick, unflexing it and releasing its stored energy onto the puck. Stick makers achieve this strength while maintaining the stick's lightness and ultimately its responsiveness increasingly through the use of materials such a fiber-glass, graphite, and aluminum. The quality of lightness has two functions. The first is fairly straightforward: players have to carry their stick up and down the ice as they skate. The second contributes, along with stiffness, to a less concrete issue—responsiveness. Responsiveness is the stick's ability to translate contact with the puck and with the ice to the player's hands. It is also the stick's sensitivity to input from the player. A lightweight stick will carry less of its own inertia, so it is able to transmit more of the inertia or feeling of both the puck and the ice (the ice has a sort of permanent inertia). Its lack of inertia also allows it to respond more quickly to changes in force and direction given by the player. Lightweight and stiffness are not the total sum of responsiveness. Materials must also be able to transmit minute sensations to a player's hands, which players translate as the "feel" of the stick. This particular quality is likely the reason that no one material has emerged as dominant in the industry. The greatest variety comes in the materials used to make the shaft of the stick. The three primary materials are wood, aluminum, and composite. wood laminate with graphite fiber wound around its core. Graphite adds little weight to the stick and is extremely rigid. 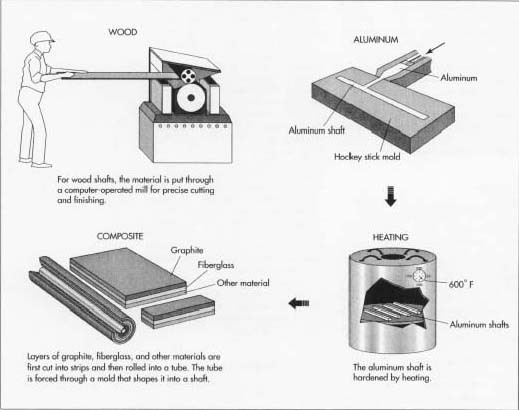 Aluminum is used by itself to make a hollow shaft. Properly formed, it has substantial rigidity and extremely low weight. Composites are comprised of reinforcing fibers, such as graphite and kevlar, and binders, such as polyester, epoxy, or other polymeric resins that hold the fibers together. Composites are used both by themselves to form hollow shafts and to reinforce wood sticks, much in the same way as fiberglass is used. These materials are generally stiffer and lighter than fiberglass. Fiberglass is used both as a layer in laminated shafts and as a reinforcement around the outside of sticks. Use in combination with wood as a laminate, fiberglass adds substantial stiffness to a shaft at the same time reducing its overall weight. As reinforcement on the outside of a stick, fiberglass mesh both contributes to stiffness and increases a stick's abrasion resistance. Hockey blades begin as wood blocks that are first cut and shaped into blades, and finally, they are dried. most blades are still made from pure ash. Blades are replaceable, and as they suffer inevitable wear from constant contact with the ice, the puck, and other players' sticks, it is generally more economical not to make them from expensive materials. 1 The lumber used to make wood shafts is first dried and cured in building-sized kilns to prevent the wood from warping after manufacture. Logs are then fed through a multi-bladed saw that cuts the wood into thin sheets. The sheets of wood and layers of fiberglass (if it is to be used) are coated with adhesive and pressed together in a heated hydraulic mold. The finished laminate is then cut into the rough shape of a stick and shipped to the stick maker. 2 The stick maker uses a saw with splayed teeth to cut the rough wood into the desired shape. Each pass on the saw cuts two corners of the shaft, so after two passes the shaft has four beveled corners and has reached its final shape. 3 A block of ash is glued onto the end of the stick. This will form the joint between the shaft and the blade. A groove is cut into the center of the block to accept a tongue shaped into one end of the blade. The tongue and groove are glued, fit together, and placed in a heated hydraulic press to cure for about half an hour. 4 The dried assembly is then shaped and smoothed on a large drum sander. The fiberglass is pulled over this assembly like a sock and is dipped in resin and allowed to dry. Once dry, the stick is again sanded to remove any rough edges. 5 Graphics are silk-screened on and parts of the stick may be painted, and the stick is finished with a clear gloss varnish. 6 Aluminum shafts begin as flat sheets, which are folded and compressed into a long block. The advantage of this is that the walls of the final shaft will be made up of numerous extremely thin layers, each reinforcing the next and making a much stronger material than one layer. 7 The long block is cut into billets roughly the size of the intended stick. The billets are then fed into a machine that heats it and pushes it under enormous pressure through a hole the shape of a hollow hockey stick shaft in a process called extrusion. The extruded metal is cut off in lengths about the measurement of a stick. 8 These pieces are then drawn through a series of smaller and smaller dies to compress the metal and bring it to its final size. 9 Finally, the metal is heated to approximately 600° F (315.5° C). This final step is called heat treating and is designed to strengthen the metal. 10 Finishing an aluminum shaft is simpler finishing a wood one. Aluminum can be painted. The metal itself may also be colored or anodized. To fit the blade, one end of the shaft is left open, a peg on the heel end of the blade is coated with hot glue, and the two pieces are clamped and left to dry. A rubber plug is inserted in the other end of the shaft for grip and safety. 11 Composite materials begin as a synthetic cloth just as fiberglass does, but most are far lighter, stiffer, and sometimes more durable than fiberglass. The primary reinforcing fiber used in composite hockey sticks is graphite. Kevlar, used in bullet-proof vests, and Nomex, used in racecar drivers' fire suits, are used in small amounts but both are expensive and somewhat more difficult to use. Most makers of composite shafts use pre-preg composite, which has been saturated with the epoxy resin that will eventually bond it. 12 Several layers of the composite material are wrapped around a mold in the shape of the finished shaft and then heated and pressed through one of three methods. The first method utilizes a traditional hydraulic press. The composite-wrapped mold is placed inside another split mold carrying its mirror image, the outer mold is closed, and hydraulic pressure compacts the composite material. The second method uses vacuum pressure to force the composite against the mold and take its shape. The third method uses an inflatable bladder as the inside mold. The composite-wrapped bladder is placed into the outer mold and then is inflated to force the material into shape. The molded shaft is finished and attached to the blade in the same fashion as an aluminum shaft. Ash blades also arrive at a stick maker's factory in unfinished form. Most manufacturers have a catalog not only of the blade shapes of their own models, but of the favored shapes of all the professional players who use their sticks. The NHL requires that a blade be 12.5 in (31.75 cm) long, between 2-3 in (5.08-7.62 cm) high, with a maximum curve of less than 0.5 in (1.27 cm) (goalies' blades have slightly different dimensions). Within these parameters, endless variables are possible. Stick makers can change the angle of the blade to the stick, called the lie. They can curve the blade at the heel or at the toe, and they can make a high toe and a low heel or just the opposite. 13 Blades are placed on a pattern or jig to be cut into their final shape. They are steam-heated or boiled then clamped in a hydraulic press to curve them. Every piece of wood used in a hockey stick is inspected before it enters the assembly process. Lumber with irregular grain, knots, or mineral deposits is rejected. The NHL sets guidelines for every dimension of a stick. Strangely, those dimensions are only enforced during a game by protest of the opposing team. If a complaint is lodged and the stick meets specifications, the protesting team receives a delay-of-game penalty. Several stick makers are experimenting with sticks made entirely of aluminum or composite material. New, lighter, more durable composites are always in development, but these materials have been available for some time and still many players choose wood-based sticks. Hockey Hall of Fame. Hockey Hall of Fame Legends. Viking/Opus Productions, 1993. Hughes, Morgan. The Best of Hockey: Hockey's Greatest Players, Teams, Games, and More. Publications International, 1997. Wilkins, Charles. "Sapling to Slapshot-that all—Canadian symbol-the hockey stickhas come a long, long way." Canadian Geographic (February 1989): 12-21. "Sports A to Z." http://test.olympic-usa/sports/az (5/7/98). "Hockey Hall of Fame Home Page." http://www.hhof.com (5/7/98). Thank you so much for this article!! It is coming in great handy for my science fair project! I have to research the background information on hockey sticks, and this is the best site I've seen all night! Thanks again for the awesome information!